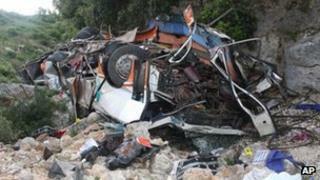 At least 11 people were killed and 22 injured when a bus fell off a cliff in southern Albania, officials say. They say the accident happened near the town of Himare, about 220km (137 miles) south of the capital Tirana. Most of the victims were university students. The driver is also believed to have been killed. Ambulances and rescue helicopters were sent to the crash site to help the injured. There are fears that the death toll could rise further. The bus plunged some 80m (260ft) off the road on Monday, police spokeswoman Klejda Plangarica was quoted as saying by the Associated Press. Some of the injured are reportedly in a critical condition. They have been flown to a hospital in Tirana. The students were travelling from the city of Ebasan to the city of Saranda. University officials said two buses had been taking 75 third-year language and literature students and three professors on the trip before their graduation, according to AP.